The basics of heart health have been drilled into our brains: Eat less saturated fat. Keep moving. Know your “numbers” for cholesterol, blood pressure and BMI. But what about that brain itself? Although life expectancy has more than doubled since 1900, our “mindspan” — how long we stay cognitively healthy — hasn’t kept pace. Forgetfulness, slower processing and feeling less sharp plague most of us as we age. One in five people develops mild cognitive impairment, a decline in thinking skills beyond normal aging, which may or may not advance to dementia. After 65, your odds of developing Alzheimer’s disease are one in 10. It doesn’t have to be that way, mounting research suggests. “The very term ‘age-related memory loss’ may be a misnomer,” says neurologist Dr. Richard Isaacson, an Alzheimer’s specialist at Weill Cornell Medicine in New York. Time and genetics alone don’t erode brain functions. How we spend our lives managing the modifiable risk factors that affect our genes is highly significant for our brain health, researchers say. That’s why you’re likely to hear a lot more in the coming years about brain health and what you can do for your own. Educating the public on this is, in fact, one of the four core purposes of the Centers for Disease Control’s Healthy Brain Initiative, which recently kicked off its 2018-2023 road map for public health agencies, says program leader Lisa McGuire. “Awareness of the steps to improve cognitive brain function is at least a generation behind that of heart health,” says cognitive neuroscientist Sandra Bond Chapman, director of the Center for Brain Health at the University of Texas at Dallas. When our fathers and grandparents died of a heart attack or stroke, we chalked it up to tragic luck. Clogged arteries, high blood pressure and high cholesterol were considered normal features of aging before 1948, when Congress commissioned researchers to begin tracking the cardiovascular lives of some 5,200 residents of Framingham, Mass. The Framingham Heart Study (now three generations old and still going) introduced the phrase “risk factors” to the medical lexicon and helped prove which prevention tactics work. Today, it’s the brain we’re in the dark about. In a review of public awareness studies by PLOS One, a nonprofit, peer-reviewed, online scientific journal, nearly half of the respondents mistakenly believed Alzheimer’s disease is a normal process of aging that you can’t do anything about. In reality, a third or more of dementia cases can be delayed or prevented by lifestyle factors, according to a 2017 report sponsored by the Lancet Commission on Dementia Prevention, Intervention and Care. Read on to find out what we can do to help our brains stay in shape. Advances in neuroimaging kicked off this new era of brain health by allowing scientists to see inside the brain. Intervention studies on how lifestyle affects brain function are newer still. One of the largest such investigations to date, the BrainHealth Project, launched in December. Researchers across more than a dozen institutions will study 120,000 subjects to find out how cognitive training, sleep, nutrition, exercise and more can extend mental strength over time. What’s already clear: All health roads lead to the brain. “The No. 1 cause of cognitive decline is healthy people letting their brains decline,” says Chapman, the BrainHealth Project’s director. That’s powerful motivation the next time you’re tempted to skip a workout or not opt for a healthy meal, do nothing about stress or loneliness, or avoid treatment for conditions like depression, anxiety, diabetes and sleep apnea. Effects of all of these choices, and many others, travel north. A particular challenge from midlife and beyond is the brain’s natural inclination to steer toward efficiency. It figures out the easiest, most comfortable ways to get something done and hits repeat. But while toweling dry in the same mechanical pattern every morning allows you to get on with the day quickly, running your whole life as a creature of habit — doing the same things, seeing the same people — deprives the brain of something else it craves: newness and challenge. Hallmarks of brain-stimulating activities that improve cognitive abilities, according to a 2017 report by the Global Council on Brain Health (GCBH) are novelty, high engagement, mental challenge and enjoyableness. If you like crosswords, fine, but push beyond to new games and challenges. Good examples from the GCBH: Tai chi, researching genealogy, picking up an old hobby you dropped, making art and community volunteering. When activities include a social component, so much the better. In 2018, a groundbreaking study became the latest persuasive link between heart health and brain health. Researchers at Wake Forest University in Winston-Salem, N.C., showed for the first time that lowering blood pressure can significantly reduce the risk of mild cognitive impairment (MCI). Standard medical care had long included a systolic blood pressure of above 140 as the target defining hypertension and requiring treatment. (Systolic pressure is the first number in a blood pressure reading, as in “140 over 80.”) In 2017, that definition was revised to 130 by the American Heart Association and American College of Cardiology. The recent, long-term, large-scale SPRINT-MIND clinical trial, sponsored by the National Institutes of Health, found that the more aggressively high blood pressure was treated toward reaching a systolic pressure below 120, the lower the risk of MCI. Treatment measures included a combination of not smoking, medication management, nutrition counseling, social and cognitive stimulation and exercise. Your brain grooves on doing — but only one thing at a time. Multitasking stresses it. Researchers say one better alternative is a cognitive exercise called “strategic attention.” The Strategic Memory Advanced Reasoning Training program at the University of Texas at Dallas, advises this: Every day, pick two substantial tasks requiring fairly deep thinking. They might be tracking and analyzing your household budget, planning a vacation, writing a memo or following a complex new recipe. Then carve out two 30-minute sessions to focus without interruption. Turn off email alerts. Shut the door. No quick scrolls through your news feed that will take you off your task. It takes up to 20 minutes to refocus after a disruption. Over time, you’ll find that you’ll achieve much more, and much more quickly, with improved attention. It’s the equivalent to your brain of a good workout at the gym. It’s not all about activity. The brain needs two kinds of downtime to function optimally: Rest and sleep. Rest means taking intentional breaks from active thinking. Try taking five minutes, five times a day, to sit still and do nothing, Chapman says. Other routes to mental R&R include mindfulness, meditation and yoga nidra (also known as iRest and sleep yoga). Not least, there’s sleep itself. Our awareness of how important it is to the brain grew with the discovery of the body’s glymphatic system — a kind of internal trash-hauling system — less than a decade ago. The system’s pace increases by over 60 percent during sleep, a possible link to why getting more sleep is linked with a reduced dementia risk. Alzheimer’s prevention experts recommend eight to nine hours a night, Isaacson says. More than 5 million Americans are living with Alzheimer’s disease. Is it time for you to talk to your doctor about Alzheimer’s? If there’s one thing that worries seniors, it’s the prospect of developing signs of dementia. These fears prompt many to visit websites that claim to provide online tests for Alzheimer’s disease. While these Internet tests may do a good job of presenting their material in an understandable and usable way, research reveals them to be ineffective for diagnosing Alzheimer’s. According to a study presented at a recent Alzheimer’s Association International Conference, online Alzheimer tests are inaccurate, unscientific and unethical. Don’t waste your time or money on online tests that may only make you more anxious about your memory issues! A battery of tests and expert interpretation are required to make an accurate diagnosis. If you have concerns about your memory, it may be time to talk to your doctor about Alzheimer’s testing. Your doctor can tell you for sure whether your memory issues are related to Alzheimer’s or dementia. And if you do have Alzheimer’s, there may be medications that can slow the progression of the disease. For more information about Alzheimer’s, visit the Alzheimer’s Association website or tap into our additional Senior Experience here. Alzheimer's disease is life-changing for both those who are diagnosed and those close to them. Having a helping hand when you need it is key to keeping yourself, and your loved one living with dementia, healthy and happy. When you need a little help or an ear to listen, support services are available. Oakmont area: 4th Tuesday of every month from 3 p.m. to 4:30 p.m. at Woodside Place of Oakmont. Erie area: last Thursday of every month from 3:00 pm to 4:30 pm at the Lincoln Community Library. When the pets visit, our residents light up and smile from ear to ear! Who doesn’t love doggie kisses, soft fur and a few barks? 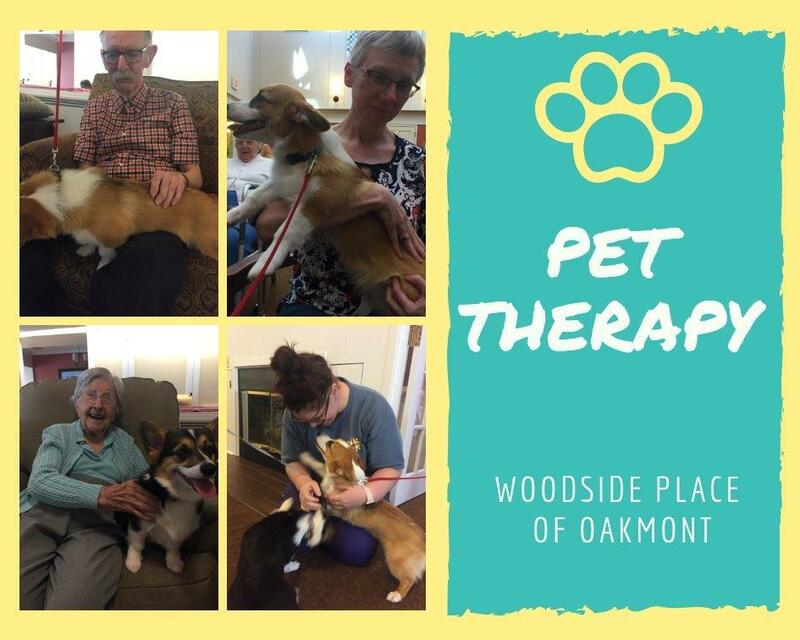 Pet therapy happens about once a week at Woodside Place of Oakmont, and the residents sure look forward to it. We have many pets that visit Woodside Place, but some of our furry friends are registered therapy dogs. As soon as one of our therapy dogs enter the building, the residents begin interacting; approaching the dogs to pet them and talk to them. Residents who are quiet often begin speaking, sharing stories of a pet they once had. And let’s not forget our team members—they love pet interactions as well. Visits have helped start conversation and create special bonds and good memories. Also, the pet therapy sessions have physical and therapeutic benefits for our residents. If a resident needs more exercise in their day, they will get it by walking a dog; we’ve found that residents are much more willing to move around if they are walking with a furry friend! If a resident needs help with fine motor movements, we give the resident a small brush and have them brush a dog. Plus, therapy animals offer stress relief! Residents enjoy relaxing in their favorite chair with an animal on their lap to pet. Pet therapy has had a positive impact on the residents and team members at Woodside Place, and we look forward to having more pets visit in the future. Are you a Caregiver? Take time to caring for yourself! Caring for a loved one with dementia can include helping with chores, medication, bathing and grooming. As the disease progresses, your loved one relies on you even more. This hard work can take a toll on care partners. According to the Alzheimer’s Association, about three out of four people report feeling concerned about maintaining their own health, and their work and social lives are usually also affected. Being an effective care partner for your loved one means also taking better care of yourself. As a leader in dementia care for more than 25 years, Presbyterian SeniorCare Network is recognized as a Dementia Care Center of Excellence. In 1991, we set the standard when we introduced our cutting-edge residential community, Woodside Place of Oakmont, which has been replicated more than 100 times nationally and internationally. From Woodside Place, we developed the Woodside model and philosophy of care—standards and best practices that solidify the specialized expertise and commitment to excellence in dementia care that we have across our Network. Recognizing that a majority of older adults may experience some level of cognitive impairment over time, our organization invests consistently in training and education for all of our team members. In fact, each team member at every level of our organization is certified in dementia care through the National Alzheimer’s Association at the time of hire. Additional in-depth training is provided annually for team members who provide direct care for individuals living with Alzheimer’s and other dementias. We have more than 70 team members who are certified dementia care practitioners that our front-line team members can call upon for even greater support and expertise. We continue to explore new ways to enhance the lives of persons living with dementia. We have spearheaded a unique collaboration to demonstrate the therapeutic benefits and positive outcomes that can be achieved through rehabilitation therapies for persons living with Alzheimer’s disease and related dementias. A world-renowned gerontology expert and one of our trusted advisors, Steven Zarit, PhD, will be overseeing this research project, which will be a joint effort between our Rehabilitation Center of Excellence and our Dementia Care Center of Excellence.